Originally published in the book Strolling in Historic East Greenwich, 2014, reprinted with permission of the author. The Second Kent County Jail at 110 King Street, East Greenwich, in 2014. The building consists of a two-story frame building, with quarters for the jailers, and an attached brick building, which on the first floor contains cells for the prisoners, complete with bars on the windows. 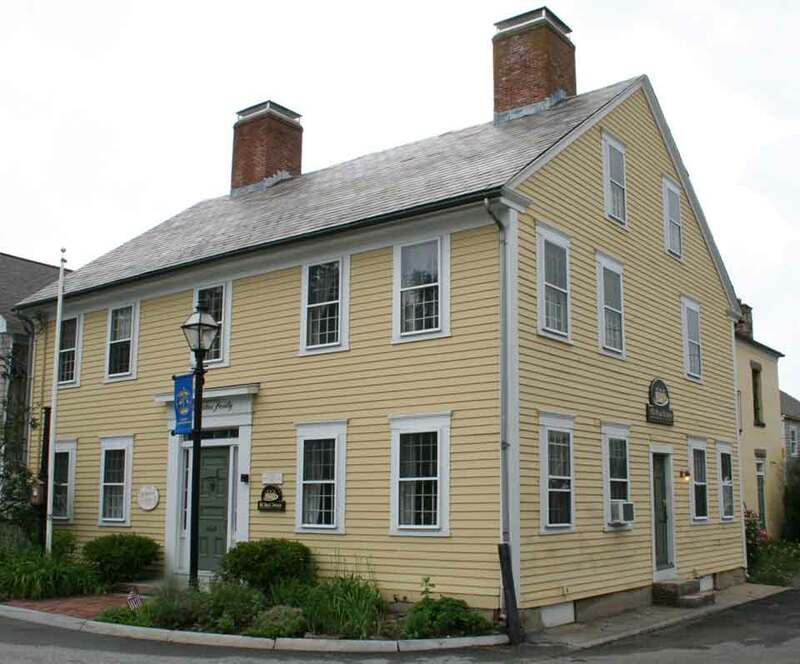 The second floor, which is today an open meeting room, is now used for the meetings of the East Greenwich Historic Preservation Society, who are the current owners of the building. The tradition is that the more cooperative prisoners were housed in the cells upstairs, which have since been removed. There was a clear view of the jail from Main Street then, just as now, even after the railroad bridge was built in 1838. There were two hand carved figures, each 30 inch high, which were above the entrance of the jail, one a black man, the other a white man, one a robber, the other a murderer, and they were handcuffed together to show that equal justice was given to all. The figure of the white man has been part of the collection of the RI Historical Society for over 100 years. There is an old tradition that when the tide came in, the water actually came into some of the cells closest to the cove! This doesn’t seem to be the case in recent memory, but perhaps as the cove silted up; it impeded the level of the tide inside the jail. Another tradition of tunnels under the jailhouse proved to be simply an elaborate system of foundation walls. In the early 19th century, Squire Wall was the Sheriff and keeper of the jail. Wall was followed by several generations of the Place family, beginning with brothers John and Earl. They were followed by Earl’s son John E. Place. John E.’s daughter Everlin Place married Jotham Smith, who became the next jailer. After Mr. Smith’s death, Everlin served as jailer for 50 years, being the first woman jailer in the United States. She was followed by her daughter Mrs. Mary Burdick, who was in turn followed by her son Frank A. Burdick, who served until 1928. In total, five generations of the Place-Smith-Burdick family served as jailers of the Kent County Jail for almost 100 years. In 1899, there were 82 commitments, 30 of these of these for drunkenness. One person was sent by the Supreme Court to the state prison, and 7 to the Providence County Jail. In 1900, 118 were committed. Crimes and misdemeanors were assault, assault with dangerous weapons, embezzlement, highway robbery, insanity, larceny, non-support, peddling without license, threats, blackmailing, and 35 for drunkenness. These figures are apparently down from earlier years, as the state institutions in Cranston had recently been built, and a number of the suspects were taken directly there. By 1957 the old Kent County Jail was completely replaced by the State Institutions at Howard, and the old jail became the property of the town. It was observed that one family had the distinction of having six generations that had served time in the old jailhouse! Under the town’s ownership, the old jailhouse eventually became the Antediluvian Calaboose Youth Center, and endured creative color choices, and some damage to the venerable old building. It was apparent that the building wouldn’t survive long under these conditions, and in June 1976, the town deeded the building over to the East Greenwich Preservation Society, which had earlier saved and restored the Brick House on Main Street. The front porch of the jailhouse was removed either just before or after the Preservation Society took ownership. The building has been restored, including the jail cells, and the first floor rented out to realtor Greg Dantis, who uses several jail cells as offices.